To read a non-PDF version of HD Insights Vol. 16, click here. The year 2016 brought a number of notable developments in HD research and therapeutic development. While an approved, disease-modifying treatment remains elusive, planning and execution of first-in-human trials investigating some of the most promising advances in therapeutic development continued in earnest. Improvements to existing symptomatic therapies moved another step closer to patient use. Researchers moved the boundaries of our understanding of neurodegenerative disease forward to propose new therapeutic targets and new directions for future work. There were disappointments for the HD community as well, with the failure of several promising compounds to show improvement in human trials; however, overall, 2016 brought the HD community a few steps closer to treatments that might slow or reverse the course of HD. Looking ahead, 2017 promises to be an exciting year for the HD community. While nothing is certain and many potential therapies are still only in the early stages of human trials, the continuing exploration of novel approaches to treat the symptoms and the progression of HD will bring many new insights, and may continue to provide hope for patients and families that one day, there will be more treatments that can make a difference. 1Teva Announces FDA Acceptance of Resubmitted New Drug Application for SD-809 for Treatment of Chorea Associated with Huntington Disease [press release]. Jerusalem: Business Wire, Oct. 20, 2016. Available at http://www.businesswire.com/news/home/20161020005246/en/. 2Teva Announces Results from Exploratory 52-Week Phase 2 PRIDE-HD Study of Pridopidine in Huntington Disease [press release]. Jerusalem: Business Wire, Sept. 19, 2016. Available at http://www.businesswire.com/news/home/20160919005508/en/. 3Carroll J. Sorry folks, the PRIDE-HD trial did NOT show that Pridopidine slows the progression of Huntington’s disease. HDBuzz Sept. 30, 2016; http://en.hdbuzz.net/227. Accessed Jan. 10, 2017. 4Wild E. Pfizer Amaryllis trial ends in disappointment: no improvement in Huntington’s disease symptoms. HDBuzz Dec. 16, 2016; http://en.hdbuzz.net/229. Accessed Jan. 10, 2017. 52016 Research Report. Huntington’s Disease Society of America. 2016. Available at http://hdsa.org/wp-content/uploads/2016/12/HDSA_RsrchInvstRpt2016.pdf Accessed Jan. 9, 2017. 6Vaccinex, Inc. Announces Continuation of the SIGNAL Clinical Trial [press release]. Global Newswire, Sept. 9, 2016. Available at https://globenewswire.com/news-release/2016/09/09/870828/0/en/Vaccinex-Inc-Announces-Continuation-of-the-SIGNAL-Clinical-Trial.html. 7uniQure’s technology: Excellence in gene therapy through innovative modular technology, proprietary manufacturing and the experience to achieve success. 2016; http://www.uniqure.com/gene-therapy/uniqure-technology.php. Accessed Jan. 9, 2017. 8Voyager Therapeutics. Product Pipeline. 2016; http://www.voyagertherapeutics.com/programs.php. Accessed Jan. 10, 2017. 9Spark Therapeutics. Our Scientific Platform & Programs. 2016; http://sparktx.com/scientific-platform-programs/. Accessed Jan. 10, 2017. 10Davidson Laboratory – Dominant Neurodegenerative Disease. http://davidsonlab.research.chop.edu/research_dominent.php. Accessed Jan. 22, 2016. Pfizer’s Phase 2 trial of PF-02545920, a PDE-10 inhibitor, failed to find the efficacy for which it hoped. In December, Pfizer announced that the therapeutic intervention in its much-anticipated Amaryllis trial produced negative results. The drug failed to show significant improvement in movement, cognition, or behavior and, as a result, Pfizer has terminated the open-label 12-month extension study. The trial included 271 individuals with HD in five countries. Despite negative results, Amaryllis has advanced our understanding of HD. “In my view, it was an important trial to run and Pfizer did all the right things… The trial itself was efficiently run, rapidly analysed, and the results released to the community without spin or any attempt to go fishing for positive news… The whole PDE-10 programme has taught us a lot about the neurobiology of HD, and how the communication between neurons is altered in the disease… the dataset from the trial will be a huge and valuable resource to help us understand the HD brain and design even better trials in the future,” says Dr. Ed Wild, MRC Clinician Scientist at UCL Institute of Neurology and Editor-in-Chief of HDBuzz, one of the trial’s lead investigators. In this edition of HD Insights, we take a look at impactful HD research articles of 2015. We searched Thomson Reuters’ “Web of Science” service in late 2016 to identify the five most highly cited original research articles reporting on original HD research published in 2015. We invited the corresponding authors to update us on their research and received the following responses. Highly Cited Article: Lim J, Lachenmayer ML, Wu S, et al. Proteotoxic stress induces phosphorylation of p62/SQSTM1 by ULK1 to regulate selective autophagic clearance of protein aggregates. PLoS Genet. 2015 Feb 27;11(2): e1004987. Autophagy offers neuroprotection by the clearance of misfolded or aggregated proteins and damaged organelles; therefore, manipulating autophagy has been investigated for its potential as a therapeutic target for neurodegenerative diseases associated with protein aggregates. HD exemplifies such illness in the nervous system, as it is the result of a pathogenic polyglutamine (polyQ) expansion in the Huntingtin gene (HTT) that leads to the accumulation and aggregation of mutant huntingtin protein (mHTT) in neurons, and subsequent neurotoxicity. Enhancement of autophagy has been shown to promote the removal of mHTT and prevent neurotoxicity;1 therefore, drugs that promote autophagy pathways hold promise for the treatment of HD. However, the development of autophagy-related drugs for neurodegenerative disease has met tremendous hurdles. For example, the detailed mechanism whereby autophagy machinery selectively degrades protein aggregation is unclear. It also remains unclear exactly how and if autophagy is altered in the progression of HD. If autophagy is impaired in the diseased state, it has yet to be tested whether autophagy function is still reparable in the context of HD. Moreover, understanding autophagy in neurons has been particularly challenging, thereby hindering the effective evaluation and development of autophagy-related drugs. In summary, our data just begins to provide insights into the regulation of selective autophagy by ULK1 and p62 in HD or other proteotoxic stress conditions. We postulate that monitoring key autophagy protein phosphorylation and VPS34 activity could provide a novel way to assess in vivo autophagic activity and signaling regulation in the CNS, and under neurodegenerative conditions. Our study suggests the potential of selective autophagy signaling as novel drug targets for the treatment of HD. 1Yamamoto A, Yue Z. Autophagy and its normal and pathogenic states in the brain. Annu Rev Neurosci. 2014;37:55-78. 2Lim J, Lachenmayer ML, Wu S, et al. Proteotoxic stress induces phosphorylation of p62/SQSTM1 by ULK1 to regulate selective autophagic clearance of protein aggregates. PLoS Genet. 2015 Feb 27;11(2):e1004987. 3Matsumoto G, Wada K, Okuno M, Kurosawa M, Nukina N. Serine 403 phosphorylation of p62/SQSTM1 regulates selective autophagic clearance of ubiquitinated proteins. Mol Cell. 2011 Oct 21;44(2):279-289. 4Pilli M, Arko-Mensah J, Ponpuak M, et al. TBK-1 promotes autophagy-mediated antimicrobial defense by controlling autophagosome maturation. Immunity. 2012 Aug 2437(2):223-234. 5Wold MS, Lim J, Lachance V, et al. ULK1-mediated phosphorylation of ATG14 promotes autophagy and is impaired in Huntington’s disease models. Mol Neurodegen. 2016 Dec 9;11(1):76. 6Park JM, Jung CH, Seo M, et al. The ULK1 complex mediates MTORC1 signaling to the autophagy initiation machinery via binding and phosphorylating ATG14. Autophagy. 2016;12(3):547-564. 7Kurosawa M, Matsumoto G, Kino Y, et al. Depletion of p62 reduces nuclear inclusions and paradoxically ameliorates disease phenotypes in Huntington’s model mice. Hum Mol Genet. 2015 Feb 14;24(4):1092-1105. Highly Cited Article: Pearce MMP, Spartz EJ, Hong W, Luo L, Kopito RR. Prion-like transmission of neuronal huntingtin aggregates to phagocytic glia in the Drosophila brain. Nat comm. 2015 Apr 13;6:6768. 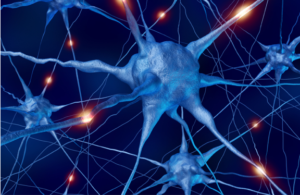 Recent research has expanded our understanding of the essential roles played by glial cells in the development and proper functioning of the nervous system, far beyond their earlier description as cellular “glue.” Glia influence neuronal excitability, regulate neurotransmitter levels, prune excess neuronal processes during development, and clear dying neurons and toxic material from the brain. In neurodegenerative diseases, activation and recruitment of glia to regions of degeneration can be both beneficial and detrimental to neuronal survival; thus, a better understanding of glial signaling pathways that become activated in the disease state could aid the development of more successful therapies for neurodegenerative diseases. Until recently, little was known about how glia respond to the presence of pathogenic protein aggregates in diseased brains. In this study, using the tractable model organism Drosophila, we examined whether phagocytic glia regulate the load of mutant Htt (mHtt) aggregates formed in neurons in vivo. We found that steady state numbers of mHtt aggregates in olfactory receptor neurons (ORNs) are reduced by Draper,1 a scavenger receptor expressed on the surface of all phagocytes in flies. Previous studies had identified an essential role for glial Draper in clearing degenerating axons during normal development2 or after axotomy,3 but this was the first indication that Draper-dependent phagocytosis could be linked to HD pathology. A growing body of evidence supports prion-like spreading of protein aggregates associated with HD and other neurodegenerative diseases, whereby aggregates transfer from one cell to another, and self-replicate by seeded aggregation of natively-folded versions of the same protein. While most studies have focused on aggregate transfer between neurons, it is possible that glia also contribute to prion-like spread. For this reason, we examined whether aggregates of mHtt formed in ORNs could initiate prion-like conversion of wild-type Htt expressed in the cytoplasm of glia. Remarkably, we observed that glial wild-type Htt was converted over time into an aggregated state by mHtt aggregates formed in nearby ORN axons (Figure, part a). Since wild-type Htt only aggregates when it comes into direct physical contact with already-aggregated Htt,4,5 the appearance of punctate wild-type Htt reported entry of ORN-derived mHtt aggregate “seeds” into the glial cytoplasm. Figure: Prion-like transmission of Htt aggregates from neurons to phagocytic glia in the adult Drosophila brain. (a) Confocal images showing that wild-type HttQ25 expressed in glia (green) undergoes time-dependent conversion from soluble to aggregated (punctate) in the vicinity of mutant HttQ91 aggregates that formed in ORN axons (red). Mutant HttQ91 was expressed in DA1 ORNs, whose axons terminate in the DA1 glomerulus (DA1g, solid white line) of the antennal lobe (AL, dotted white line). Scale bars = 10μm. (b) HttQ25 aggregate formation in the DA1 glomerulus of 7-day-old adult flies was blocked in flies homozygous for the drprΔ5 null mutation (draper -/-). Scale bars = 5μm. (c) Model for prion-like transfer of neuronal mutant HttQ91 aggregates into the cytoplasm of glia via Draper-dependent phagocytosis. Whether ORN-derived HttQ91 aggregates escape into the glial cytoplasm during phagocytic engulfment or at a later step in phagocytosis (dotted lines) is not known. (a and b) reproduced with permission from ref. . These findings indicate that mHtt aggregates undergo prion-like transfer between the cytoplasm of neurons and glia in the intact Drosophila brain. We next took advantage of the extensive genetic toolset available in Drosophila to elucidate the mechanism responsible for neuron-to-glia Htt aggregate transfer. To our surprise, induced aggregation of glial wild-type Htt was eliminated in mutant flies that lack Draper expression (Figure, part b). In addition, RNAi-mediated knockdown of several glial genes with previously identified roles in Draper-dependent phagocytosis inhibited formation of wild-type Htt aggregates in glia. These exciting findings suggest that neuronal mHtt aggregates engulfed by Draper-dependent phagocytosis can escape from the phagolysosomal system and gain access to the glial cytoplasm (Figure, part c). Our study suggests a double-edged role for phagocytic glia in HD pathogenesis — eliminating toxic mutant Htt aggregates from neurons, but also contributing to aggregate spread between cells. Numerous additional studies in the past few years have led to increased awareness of phagocytic glia as active players in neurodegeneration, and therefore potential therapeutic targets. In mice, the Draper homolog MEGF10 regulates turnover of synapses by phagocytic astrocytes in the adult brain,6 suggesting that protein aggregate clearance from axons might occur by a similar mechanism in mammals. Future studies into how prion-like aggregates spread between neurons and glia, and the specific neuroprotective and neurodestructive functions of phagocytic glia will help to guide new strategies in the battle against HD and other neurodegenerative diseases. 1Pearce MMP, Spartz EJ, Hong W, Luo L, Kopito RR. Prion-like transmission of neuronal huntingtin aggregates to phagocytic glia in the Drosophila brain. Nat comm. 2015;6:6768. 2Hoopfer ED, McLaughlin T, Watts RJ, Schuldiner O, O’Leary DD, Luo L. Wlds protection distinguishes axon degeneration following injury from naturally occurring developmental pruning. Neuron. Jun 15 2006;50(6):883-895. 3MacDonald JM, Beach MG, Porpiglia E, Sheehan AE, Watts RJ, Freeman MR. The Drosophila cell corpse engulfment receptor Draper mediates glial clearance of severed axons. Neuron. Jun 15 2006;50(6):869-881. 4Chen S, Berthelier V, Yang W, Wetzel R. Polyglutamine aggregation behavior in vitro supports a recruitment mechanism of cytotoxicity. J Mol Biol. Aug 3 2001;311(1):173-182. 5Ren PH, Lauckner JE, Kachirskaia I, Heuser JE, Melki R, Kopito RR. Cytoplasmic penetration and persistent infection of mammalian cells by polyglutamine aggregates. Nat Cell Biol. Feb 2009;11(2):219-225. 6Chung W-S, Clarke LE, Wang GX, et al. Astrocytes mediate synapse elimination through MEGF10 and MERTK pathways. Nature. 11/24 2013;504(7480):394-400. Teva CNS is committed to continued research and development of its product portfolio and to the development of medicines aimed at meeting the specific needs of the patient communities it serves. Teva’s legacy in CNS is grounded in its commitment to ongoing collaboration with academia, medical institutions and patient advocacy groups to find innovative solutions for patients who live with chronic and debilitating diseases.